When people become Catholic they often describe it as “coming into full communion with the Catholic Church.” That might sound like an obtuse description of the event, but it is actually both accurate and important in its details. This is because Catholics consider all validly baptized Christians to be “in the Church” even if they are not members of the Catholic Church. In fact, to whatever degree a given Christian group affirms the truths of the faith, to that degree it can be considered “in communion” with the Catholic Church. Thus, a validly baptized Christian who becomes Catholic is actually moving from partial to full communion – not “converting” (talk of “conversion” should technically be reserved for non-Christians becoming Catholics). This viewpoint has ramifications for several other considerations as well, and an understanding of partial and full communion will clear up much confusion. The Greek word for “communion” is κοινωνία (tr. koinonia). It appears in 43 verses of the New Testament. It means “sharing” or “fellowship” as can be seen in several examples. It is probably best exemplified in the communal life of the believers described in Acts 2:42. Likewise, we also find the term related to the Eucharist (aka communion) in 1 Corinthians 10:16. Thus, the term is closely related to the very idea of the Church – people called to God’s community of faith. As stated in the Nicene Creed, there is only one Church. The Church that Jesus Christ founded was founded on Jesus’ apostles (Mt. 16-18) and built from people united to Jesus’ apostles or their successors (Eph. 2:20; 1 Timothy 1:6, 4:14, 5:22 ). So long as one is validly baptized, he is part of this one Church (Eph. 4:5) even if not in perfect communion with it because the Church is Christ’s body (1 Cor. 12:27) – not a bunch of body parts – and Christ cannot be divided (1 Cor. 1:13). This, however, did not stop Christians from making in-house distinctions (Rom. 14:2-3) as well as illicit divisions (1 Cor. 1:12). The latter occurred when one departs from the faith (apostasy – 1 John 2:19), knowingly commits to serious doctrinal error (heresy – 2 Pet. 2:1), or refuses submission to the authority of the Church (schism – 1 Cor. 1:10), or breaks unity over secondary issues (disputes – Titus 3:10). Depending on which of these wounds to unity are at work, the resultant communion relationship is altered. For the Catholic, only total apostasy breaks communion 100%. Catholicism sees itself as encompassing the One, Holy, Catholic, and Apostolic Church. This does not mean, however, that non-Catholics are completely outside her boundaries. Because communion with the Catholic Church is based on baptism, and at least some elements of Christian faith are held in common among all legitimate Christian groups, their validly baptized members are considered to be in partial communion with the Catholic Church. Thus, even Protestants are considered in partial communion and therefore individual Protestants are not necessarily outside the Catholic Church. So it is that when a Christian becomes Catholic the Church sees them as moving from partial to full communion, because even as non-members they were already part of the Church. These distinctions also help explain the Catholic Church’s view of salvation. Because the Catholic Church distinguishes between full and partial communion, non-Catholics are not automatically “outside the Church.” Thus, the fearsome statement that “Outside the Church there is no salvation” does not simply apply across the board to all non-Catholics. However, partial communion is not equivalent to some “mere Christianity” that is based only on areas of complete agreement. A group on the fringe of communion with the Church may indeed partake in God’s grace by reading Scripture or through prayer – but these alone may not be sufficient for true salvation. A good example of this might be some heretical Christian sects. Even the grace of having God’s word before them is not a guarantee of salvation due to their distorted understanding of the Scripture. Although most clearly stated at Vatican 2, the council did not invent a new interpretation of “no salvation outside the Church” as it is often claimed. We see seeds of such a view in Scripture (e.g., Acts 10:34-35; Rom. 10:14-18) as well as the teaching of early Church Fathers like Justin Martyr. Further, Thomas Aquinas asserted the possibility of receiving grace in extraordinary ways (e.g.. “baptism of desire”). Finally the extreme Jansenist understanding of this teaching was rejected by Pope Pius V and at least one pre-Vatican 2 priest (Fr. Leonard Feeney) was excommunicated for holding an extreme view. Many doctrinal issues take time to formulate or clarify, and the statement “no salvation outside the Church” is no different. The fact of partial communion does not mean that all is well, however. Jesus, Paul, and Peter were quite clear that unity is a non-negotiable in the Christian life. Thus, to the degree that these groups have caused disunity in the body of Christ, they are in sin and missing out on the fulness of the faith. This is why the Catholic Church continues to strive for ecumenical dialog (in the best sense), rather than making allowances for division or (worse) raise separation to a virtue. It is also why legitimate diversity is permitted and encouraged to enrich the faith. Groups in full communion with the Catholic Church are not dividing it. Rather, each is forming the one Catholic Church for its own region or culture. 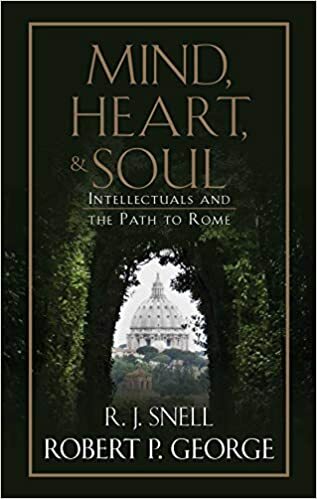 Finally, because it is through Christ’s Church that the fullness of the means of salvation can be obtained, many significant elements in the life to the Church may be missed by those outside her visible boundaries – but many do exist. It follows that although these separated communities are deficient or even distorted, they retain some measure of grace (often quite a bit). 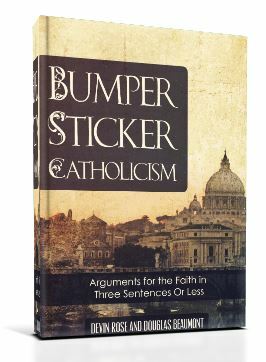 Thus, while the Catholic Church does not consider herself in complete disunity with those who have separated from her in one way or another, the wounds to unity are not simply accepted as legitimate visible variations in an otherwise singular, invisible Church (as opposed to “Branch Theory“). The idea of partial communion helps explain why the Catholic Church can at once believe that salvation is not found outside herself, and yet extend the possibility of salvation to non-Catholic (and even non-Christian) groups and individual persons. God’s offer of salvation is far richer, though, than a mere “Get-Out-of-Hell-Free Card,” as his will for his people is far more grand than an eternal change of location. So, while the fullness of the faith with all the graces available to mankind is only found in God’s Church, this does not mean that none are found elsewhere. *A note on the chart and examples: I strove for simplicity on this chart, but it quickly got complicated (and could be much more complicated). I settled for illustrating the most general, high-level distinctions of importance for this topic, namely what the Catholic Church sees as dividing line types between the major categories of religious groups. I also included some examples of groups that fit those categories from the Catholic point of view. 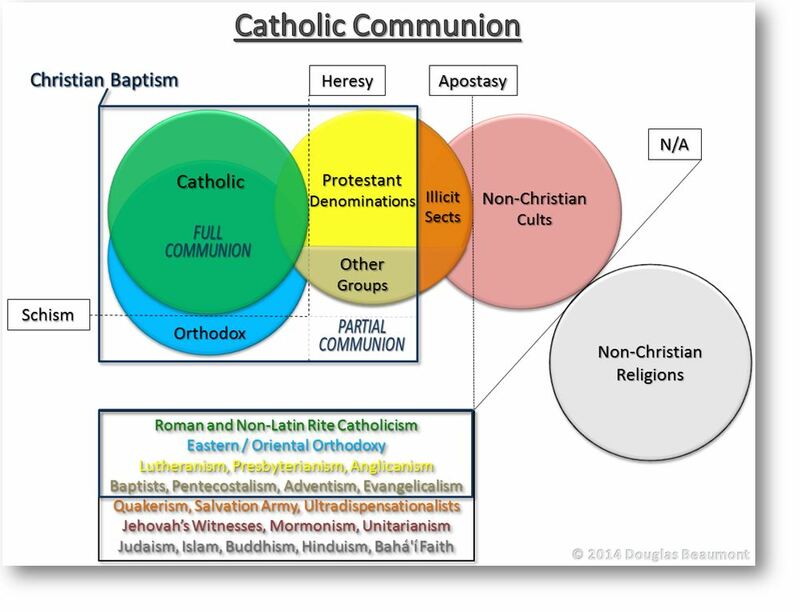 Because the Catholic “partial communion” line is drawn at valid Christian baptism, any groups who do not validly baptize – or whose doctrine is unacceptably unorthodox – will be outside that box.